Plurals lets you specify the string to display for different quantities. So how do we use this Plurals thing? Remember, your parent node must be <resources>! I created a basic layout with TextViews to display what each of these strings look like. 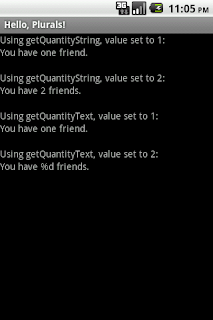 Take note though that getQuantityText() returns a CharSequence and not a String! Also, from what I have noticed, and as the name mildly suggests, getQuantityText() gets the actual value of the text you defined in your xml.